Nearly seventy-five people gathered in front of Lockheed Martin’s Valley Forge, Pennsylvania complex in King of Prussia, Pennsylvania on January 17, the federal holiday observance of Martin Luther King, Jr. Day. A half block long line of people, holding banners and signs and standing next to large self-standing pictures of Dr. King, chanted “the arc of the moral universe is long, but it bends toward justice”, heard Jane Dugdale of Main Line Peace Action speak about the military budget, and listened to the extended audio broadcast of excerpts of sermons and speeches of Dr. Martin Luther King, Jr. A bell tolled after a Litany of the King Day Memorial (see below) as eight people, prepared to be arrested in civil disobedience, walked into the crossing of the Lockheed Martin main driveway. Wearing sandwich board signs – one side with a graphic of King and “It’s About Justice…Make War No More”, and on the other side what the cost in the billions of a Lockheed Martin weapons systems (e.g. the F-35) would mean if spent on domestic human needs – the Lockheed Martin resisters blocked the entranceway and walked onto the company property with large signage from the LOCKHEED-VILLE exhibit reading “LOCKHEED-VILLE – Many Suffer, Few Profit”. All eight were arrested, taken to the Upper Merion police station and released on disorderly conduct citations. 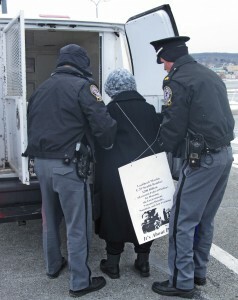 Those arrested: Tom Mullian, Prospect Park, PA; Annie Geers, Media, PA; Fr. Patrick Sieber, Camden, NJ; Mary Jo McArthur, Beth Friedlan, Sr. Margaret McKenna, M.J. Gentile, and Robert M. Smith, all of Philadelphia, PA. The Martin Luther King Day 2011 demonstration and civil disobedience marked the 33rd consecutive year that the Brandywine Peace Community has honored the legacy of Dr. Martin Luther King, Jr. and his message of justice, peace, and nonviolent action. Since 1993, the annual King Day observance has been organized as part of Brandywine’s ongoing campaign against Lockheed Martin. One of the people arrested on January 17, Robert M. Smith, staff person and co-founder of the Brandywine Peace Community thirty years ago, was in attendance at Riverside Church in New York City to hear Dr. Martin Luther King, Jr. on April 4, 1967, exactly one year to the day before Dr. King’s assassination. In the speech, entitled “Beyond Vietnam: A Time to Break Silence”, Dr. King called for nonviolent resistance to the Vietnam War and to “the evil triplets of American society: racism, materialism, and militarism”. Hearing Dr. King on April 4, 1967, Smith made a commitment at Riverside Church that would direct his life. Smith refused to register for the Vietnam era military draft and subsequently went to jail. For more information, go to www.brandywinepeace.com. Reader: Today, we remember a martyred prophet, a “drum major for justice,” a peacemaker, and nonviolent revolutionary. Today, we stand before Lockheed Martin, the world’s largest war profiteer and weapons corporation, remembering all the victims of war and the economy of weapons building, remembering all the casualties of social and environmental neglect, remembering and mourning all who suffer and die on the altar of corporate greed, empire, poverty, and violence. Today we honor in word and deed the legacy of Dr. Martin Luther King, Jr. Over the past three decades, we have gathered on Martin Luther King Day. Standing before Lockheed Martin today, we challenge the dominance of militarism in our society, culture, and economy. We continue to gather in a time of war and suffering insisting on and struggling for a fundamentally new day of justice and peace, a day when war will not occupy the central place in our society and no one will be “left out in the cold,” victims of an economy devoted not to human community and justice but to war. Reader: In 1967, Dr. King called the U.S. government “the greatest purveyor of violence in the world today.” Despite cuts in the number of nuclear weapons promised in the U.S.-Russia START agreement still nothing today signifies the threat of global violence more than the continuing existence of nuclear weapons which have poisoned our earth, our spirits, our imagination and historical claim on the future with the threat of unimaginable death and destruction In the latter 1970’s the Brandywine Peace Community protested at the General Electric plant here in King of Prussia producing Mark 12A nuclear warheads for Minuteman III intercontinental ballistic missiles. Those GE plants here in King of Prussia and the Delaware Valley now bear the name of Lockheed Martin. Thirty years ago, on September 9, 1980, the Plowshares 8 damaged with hammers Mark 12A warhead casings. Last October, Lockheed Martin, which was formed in the series of mergers and acquisitions involving GE, received here in King of Prussia a $106 million contract to build field support equipment for Mark 12A/Minuteman III nuclear missiles. On this Martin Luther King, Jr. Day there are still 5, 113 nuclear bombs in the U.S. arsenal and Lockheed Martin is the U.S.’s chief overall nuclear bomb contractor. Reader: The U.S. Military Budget is now nearly a trillion dollars annually for war and the Pentagon’s global reach. The cost of the continuing war in Iraq and the escalating war in Afghanistan is financed through additional spending bills. Economists believe the cost could reach $2 Trillion. The culture of militarism and war, and the economy of war which sustains it, is the very existence of Lockheed Martin. The economy of war is the proverbial “elephant in the room” of the continuing economic crisis. Whole communities have become “casualties of war,” more and more suffer for the profits of a few. Reader: Today at Lockheed Martin we honor the legacy of Dr. King and the struggle for justice and peace. We choose to walk in the memory and steps of Dr. Martin Luther King, Jr. We honor Dr. King’s philosophy of nonviolent direct action and his opposition to injustice and war. Our memorial to Dr. Martin Luther King, Jr. is an active commitment to justice and peace and our continued nonviolent resistance to the injustice that is war, and the making of war that is Lockheed Martin.